For many organizations, the success or failure of IT initiatives is based on the selection of the appropriate technology vendors. Despite the critical nature of this process, many organizations underestimate the time and effort it takes to make a well-informed decision. Below are some considerations to help your organization simplify the vendor selection process. Another key activity in this process includes assembling a list of all the potential vendors. The financial state and stability of the vendor, installation and integration support, training/education, maintenance agreements, upgrade and enhancement policies, customer service reputation and budget considerations should all be considered. Business and technical requirements described in a way to ensure vendors can present their solutions in the best possible manner. In this stage, an organization would evaluate the vendor RFP responses to determine the one that best meets the its business needs. In addition, the organization should conduct a thorough investigation by obtaining input from all stakeholders. Before reviewing and evaluating the responses of the vendors, an evaluation sheet based on the RFP should be created. 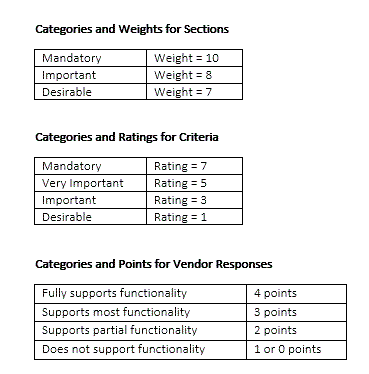 By weighting each of the criteria and evaluating each vendor’s response against these criteria, the organization will obtain a total score per vendor.